Zoooo… is a collection of 33 poems mostly about animals from around the world, sometimes amusing, at other times more serious and philosophical. As such, it is hoped that this book will inspire as well as provide food for thought for young people about the beauty and fragility of the natural world, and the interrelationships – sometimes complex – of living organisms. Rita Mühlbauer is a professional artist internationally renowned for her skills as a natural history artist, more especially in portraying the diversity and fascination of the world’s wildlife. She has produced numerous illustrations over the years, including books for children, and has also travelled extensively in search of new subjects to draw and paint. Which he saw wriggling in the grass. Is he there – or isn’t he? Or perhaps the wind itself. And settle on its flanks. The King – magnificent – rests now. When is a Hippo happy? Or on sandbanks where they bask. When the lions have finished their fast. Perhaps they just like being lazy. And to them, they find sublime. They are accompanied by delightful illustrations in black and white - notable and welcome difference from the multi-coloured pictures so often found in children's literature. The eight/nine years old I shared these with laughed, asked questions and also simply enjoyed them. They would be a welcome addition to a classroom poetry shelf or a private child's collection. Bernie Froggatt, Formerly Headteacher of an Infant School and School Inspector. My best poem was Selfish as a Shellfish, it had a good rithem. The picture that went with it was cool. My mark out of ten was ..... 10/10 out of the whole book! It was awsome and I think children will love this book. I love it. Zoooo… is a charming collection of poems about animals and plants from around the world, each supported by wonderful illustrations. The poems range from dark comedy through to informative and philosophical tones, all immensely engaging and accessible for readers of all ages. Reading as an anthology of the world around us Zoooo… provides new insights into well known and some lesser known creatures, providing information that even I was not aware of. The book opens new doors of interest and acts as a fun portal into exploring the world's natural history: my favourite being the Guinea Pig's Lot. Whilst Loxdale's poems could stand alone they are beautifully partnered with Mühlbauer's artwork, each sublime with hidden gems in each. 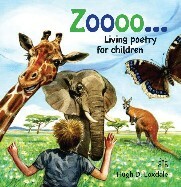 I thoroughly recommend Zoooo… to anyone, child or adult alike, with an interest in the natural world.